The Chatham Anglers (17-15-2) will look to extract revenge on the Yarmouth-Dennis Red Sox (20-10-4) on Saturday at Veterans Field. The A’s have lost consecutive games to the East Division leaders and need a win to continue to close the eight-point gap that separates the two teams in the standings. Y-D became the first team to clinch a spot in the playoffs with an 8-2 win over the Bourne Braves on Thursday. Chatham sits in second place in the East Division, leading the third-place Harwich Mariners by 2.5 games. Alek Manoah (West Virginia) and Jeff Belge (St. John’s) — the A’s scheduled pitchers Saturday — have each thrown against Y-D this season. Manoah had a disastrous fourth inning that ruined his outing at Red Wilson Field on July 8. The 6’7” hurler escaped a bases-loaded jam in the first, retired the side in the second and third before imploding in the fourth. He allowed six runs (five earned) in the fourth and struggled with fastball command — which he said is “the foundation of what he does” —, walked three and hit two Y-D batters. Alek Manoah has 30 strikeouts in 22.1 innings of work this summer. In the most recent matchup between the sides on July 15, Belge didn’t have his best stuff. The left-hander allowed home runs in each of the first two innings to put the A’s in a three-run hole. Belge lasted four innings, surrendering six hits and four runs. The Anglers had brought the game within one by the fifth inning thanks to a Colin Simpson (Oklahoma State) two-run homer, but failed to provide the finishing touch. By the eighth inning, the notorious Chatham fog had played its part again. Looming high above field for most of the game, the thick layer of white settled at field level in the eighth inning, forcing the game to be truncated as Y-D celebrated a 5-3 win. The Red Sox came out flat after clinching a playoff berth Thursday, losing to the last-place Brewster Whitecaps, 7-3. Brewster’s Zach Linginfelter (Tennessee) worked a no-hitter into the sixth before Noah Campbell (South Carolina) broke it with a double. Y-D committed five errors en route to its 10th loss of the summer. 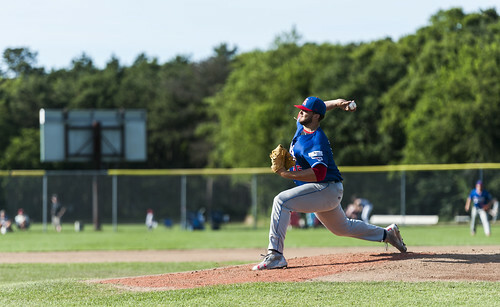 At the same time in Cotuit, the Anglers and Kettleers fought it out in one of the games of the summer. The home team plated seven runs in the first two innings, but Chatham gradually battled back. Troy Miller (Michigan), Zack Noll (Point Loma Nazarene) and Greg Veliz (Miami) held Cotuit scoreless for the final five innings while home runs from Simpson, John Rave (Illinois State) and Spencer Torkelson (Arizona State) propelled the A’s to a comeback victory. Jorge Arenas (Stetson) provided the winning run, blooping an RBI single to score Greg Jones (UNC Wilmington), putting Chatham up 10-9.